At times this album is a sparse haunting prog rock version of very very dark country/roots music. Almost as if Syd barrett has come back to explore roots music. At other times it has a Doorsian feel. In fact many of the songs are reminiscent of the Doors at their most reflective and eerie. The echoing (but pleasant!) vocals and the haunting instrumentation ensures this is never an album to really lift the spirits but it always has something of interest going on and the experimentation with the ‘gothic gloom’ really does work. 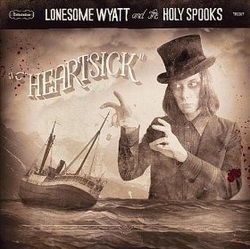 It’s difficult to describe as ‘country music’ but despite the echoing production it still comes across as having that slightly threatening otherworldly backwoods feel and huge credit should be given to people such as Wyatt for the experimentation they bring to roots music. There are some strong catchy melodies that whilst they are probably not hummable do stick in the mind in much the same way as much of ‘Sixteen Horsepower’s’ output. The songs are all well written and whilst not overtly ‘country music’ there are elements included and very likely a fair amount of tongue in cheek humour, but don’t expect too many laughs. Going Crazy probably has the biggest link to country with it’s twangy, walking bass line and because of that has slightly less melancholia than the other songs. Fans of ‘Those Poor Bastards’ (of whom, I’m one!) shouldn’t be put off by the slow, moody gloom. Give the album a few listens and you will find this is merely the other side of the same musical coin.